• 트윗은 누출된 에피소드를 온라인으로 직접 연결 시키거나 해적판에 관한 정보를 제공하지 않았지만, Starz는 여전히 트윗을 일시적으로 제거 할 수있었습니다. • EFF는 이 게시 중단 통지에 대한 반박을 제기했으며 "Starz는 향후 게시 중단을 철회하고 언론인을 괴롭히지 않아야한다"고 덧붙였습니다. • "DMCA에 대해 지나치게 광범위한 해석이있는 것으로 생각합니다. 트위터가 내 트윗과 EFF의 유사한 트윗을 내리는데, 동의하는 것에 실망합니다. 분명히 침해하지 않았는데 말니다. "라고 Ingram은 말했습니다. • Starz는 TV 저작권 침해에 대한 기사와 연결된 트윗을 보고한 것에 대해 사과했습니다. 성명서에서 "미국 신들"의 에피소드가 온라인에서 유출된 것과 관련 너무 지나쳤다고 인정했습니다. "Officer, it was terrible! Someone broke in and started issuing DMCA takedown notices in our name!" I don't see how dispute resolution mechanisms can ever be cheap enough to run at scale. I think it's always going to be easier to take stuff down unless doing so garners the platform sufficiently bad press. If the platform asks the user and the user says it’s not infringing, there’s no liability for the platform & the recourse is to litigate. Obviously that would not happen in this case. I get why platforms bias here to conservative lawyers, but the safe harbor is really safe. 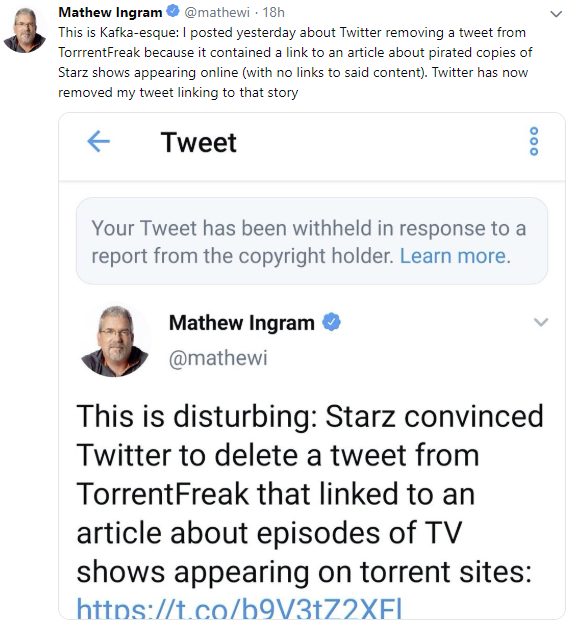 The @Starz Twitter takedown frenzy now extends to articles describing articles that people link to on Twitter. This one, for example: https://t.co/wnu8vZaPYh not to mention the original piece: https://t.co/eXKNeiUgZR Do the Internet a service and point to both, please. "In most cases, there were visible signs revealing that the leaks were sourced from promotional screeners"
Now they're taking down other tweets with these links to NEWS STORIES. If it's happened to you, get in touch with me! Just FYI, Starz has appropriately apologized for the overzealous takedowns: https://t.co/WFdCTNPu51.